It started with fish sauce and a desire to help people develop a curiosity about the Bible. For years, Fr. Vien Nguyen, SCJ, had a Facebook account. As did many, he signed up for the social media platform when it first entered the cultural landscape. That changed about a year ago. Fr. Vien was coming to the end of his doctoral studies in Sacred Theology and began to think more seriously about an idea that been rolling around in his head for a while: in the midst of selfies, cat videos and political messages, could there be welcome space on social media for reflection on the Bible and the Church? With a population of 2.32 billion, Facebook has a lot of people; it seemed like a good place to live Fr. Dehon’s directive. Which brings us back to fish sauce, a primary cooking ingredient in Fr. Vien’s homeland of Vietnam. Starting with something familiar, he wrote about the use of fish sauce in Roman times, trying to make connections between the time of Jesus with people today. Fish sauce was popular then as it is now. The response was very positive; people asked if they could share the post. He wrote more, making the posts public so that anyone could view them. Topics have included women in the Bible, scripture quotes, the Mass, and marriage. The last two, especially explanations about the Mass, have gotten the strongest response. Typing the day’s reflectionAnd this is part of the fun for Fr. Vien. He left Vietnam when he was 14, and after time in a Philippine refugee camp, his focus turned toward embracing his newly adopted home: the United States. This meant focusing on English and learning American culture. His language skills in his mother tongue, said Fr. Vien, are still those of a teen. “But that is a benefit,” he added. It allows him to write in an approachable style which many can easily understand, especially youth and young adults. “If I wrote in English and just translated the text into Vietnamese the language would be much different,” he said. With the focus on Vietnamese, he can incorporate humor “and even a bit of sarcasm,” he said. “It is fun, but it doesn’t necessarily translate well.” The English reflection often ends up being a simple summary of the Vietnamese text without the humorous nuances. But this too is helpful for his intended audience. 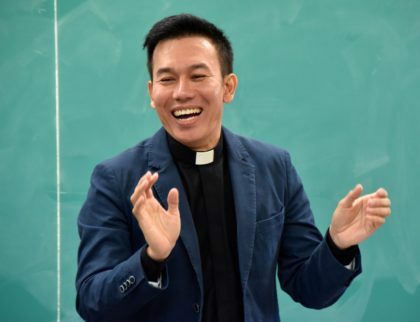 It is a way for young Vietnamese Catholics, including many seminarians, religious sisters, and others pursuing advanced studies, to work on their English language skills without needing to make their way through a web of academic jargon. The response to Fr. Vien’s daily posts has been tremendous. However, it is not the number of “likes” that he finds to be significant. “It is the comments people have about each day’s reflection, their interaction with each other.” Fr. Vien likes to think that the posts get people to think about Scripture in a casual format and then challenge them to dig deeper. He writes the posts every day and after about seven months he took a two-week break to reassess what he was doing. It was then that he realized that the reflections were having a significant impact. “People I met at functions in Houston and Chicago told me that they appreciated the posts, that they were understandable and interesting, especially information about the Mass itself, why we do what we do during the Mass,” he said. Others contacted him as well, asking him to continue. He returned to Facebook with the daily postings, often with a piece of art, and hasn’t stopped since. “It has been a way for me to develop the habit of writing regularly,” he said. Fr. Vien has been working to develop his Vietnamese language skills for more substantial efforts, including a commentary – in Vietnamese – on the Gospel of Luke. Already, he has written 150 pages of what he envisions to be a 500-plus page book. He hopes to later work with biblical scholars to fine-tune the text before seeking to publish the commentary. Again, he notes that there are many excellent texts in English, but not in Vietnamese. Writing in Vietnamese, instead of simply translating an English text, allows Fr. Vien to incorporate Vietnamese culture into the commentary, literally inculturating the text. When asked if he has long had a love of reading and writing Fr. Vien laughs and quickly answers “No!” Except for an occasional John Grisham novel, for most of his life Fr. Vien only sporadically read for pleasure, much less wrote. But that changed when he began his doctoral studies. “It made me disciplined when it came to regular reading and writing, and spending time in the library. Eventually, I realized that I actually liked it! Now, he would like to better know Vietnamese culture through its literature, both classics and contemporary writing. “I want to know what is popular with young people, but I also want to learn about the ancient writings,” he said. Fr. Vien’s Facebook posts can be found on his personal page (Vien Nguyen, SCJ). All are public so that anyone with a Facebook account can view them. When he isn’t writing, Fr. 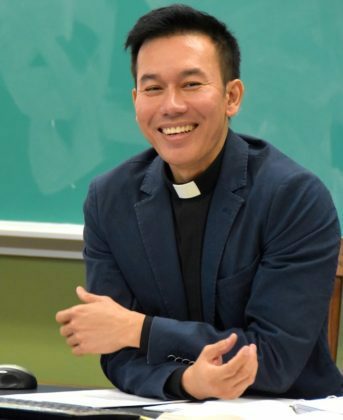 Vien, 45, is an assistant professor of Scripture Studies at Sacred Heart Seminary and School of Theology. His doctorate in Sacred Scripture is from Santa Clara University in California.